So three months ago, my best friend celebrated her 17th birthday. I, of course, had planned on making her the above cake and giving it to her on the big day itself, but she was at a convention for her BBYO chapter. 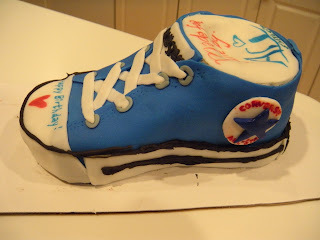 (NOTE: I had known I was going to make a Converse shoe for her since her 15th birthday. I plan ahead.) Anyways, so after her convention, I got really busy, and I didn't have time to make a cake. Then, she went to summer camp for the entire summer, and I knew I had to finally get her the long-awaited birthday cake she deserved. So I made this cake with her boyfriend and we sent it up with a camp counselor in a tiny Converse shoe box covered in tissue paper. It was a very special delivery! NOTE: This entry cannot be possible without a plethora of links. Bear with me. So at 4 PM on August 3, I found out about the Threadcakes cake contest via CakeWrecks. The contest deadline was midnight the same evening, and, being a lazy teenager in the summer, I decided to go for it. 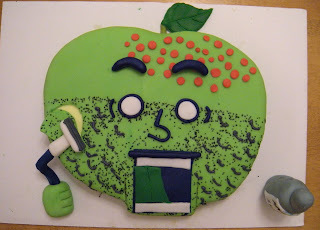 The contest was to interpret a Threadless t-shirt design into a cake. I decided (in my almost insane mind) that I would make TWO cakes, this being one of them. It's based off this tee. I covered the dog-shaped cake in black fondant and used dark blue and white fondant to replicate the shapes. 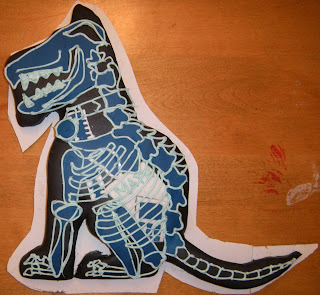 For the x-ray lines, I used thin lines of light blue icing. These cakes were definitely a challenge: with less than ten hours to make two cakes, get ingredients, and feed myself like a healthy person, I had to work fast. Luckily, I had a few friends over for moral support/photography--the entire cake process had to be photographed for authenticity. This was a really fun experimental cake! This cake was a last-minute request. My only requirements were to make it Vegan and in the shape of a J. My friends came over to assist me, because they knew the recipient of the cake and I did not. 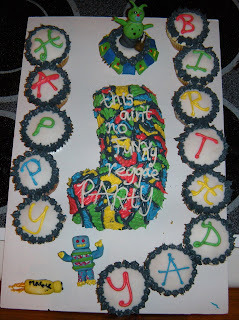 Upon hearing that the recipient's 2 favorite things were beer and music, we incorporated those into the cake as well. Somehow, we landed on a theme of "your birthday in space!" and ran with it, leading to this psychedelic birthday cake.